Its been a busy time so far in 2018. We started installing a new bathroom in the Cottage and completed last week. Images will follow soon on the Cottage page. We also installed a complete new WiFi system for Guests covering the Apartment and the Cottage. Reception and coverage is now even better! As a respite from work on the Cottage, we made a video for Follow Your Bliss Café in Bangor! FYB is a superb Gluten free Café run by Lesley Wills. She is expanding to new premises with more space for the Café and take away. Follow Your Bliss offers Gluten free, Vegetarian and Vegan freshly made foods such as Lesley’s famous wraps, cakes, health drinks and other delights. An excellent water Kefir is made by FYB. The new premises on Bangor high street will have upstairs space for Health facilities and education – such as cooking classes, Yoga, Personal Training, and so on. This takes Crowdfunding and Lesley has set up her project on Follow Your Bliss Cafe at Indiegogo. click the link. A wide variety of cuisine is available within a few miles of Coed y Berclas. The range on offer includes something for every taste, occasion and purse, from takeaway to superior formal dining – from historic buildings in Beaumaris to grand country house hotels. Castle Street, LL58 8AW. 01248 810415. A Best Western hotel with a restaurant, bistro and coffee shop. Castle Street,LL58 8AP. 01248 812990. Ground floor is a fish-and-chip shop, upstairs is Café Neptune – a restaurant serving locally caught seafood. Church Street, LL58 8BB. 01248 810302. AA Rosette awarded restaurant, local produce wherever possible. Castle Street, LL58 8BA. 01248 810362. A family run pub serving food – lunch and evenings. 13 Castle Street, LL58 8AP. 01248 811230. Open: Food served 12:00 – 15:30 17:00 – 22:00. Coffee/Wine Bar 10:00 – late. The Pier House Cafe and Bistro. 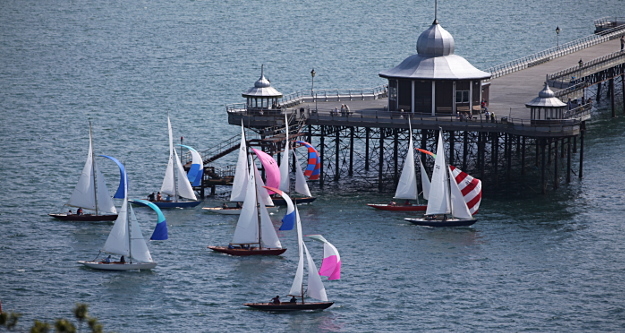 At the root of Beaumaris pier, LL58 8BS. 01248 811055. Ice creams and sorbets made on the premises, drinks and light meals. 30 Castle Street, LL58 8AP. 01248 811010. 11 Church Street, LL58 8AB. 01248 811534. Dale Street, LL59 5AW. 01248 716377. Open Tuesday to Thursday 5:30 – 9:30, Friday and Saturday 5:30 – 10:30, also Bank Holiday Mondays. Booking ahead advisable. Restaurant and bar beside The Menai Suspension Bridge. Open 12:00 -2:30, 6:00 – 9:30 Booking ahead advisable. 1 High Street, LL59 5EE. 01248 208131. Open Thurs/Fri/Sat 19:00 – 23:00 Different approach to dining – excellent reviews. Must book ahead. St George’s Rd, LL59 5EY. 01248 716714. 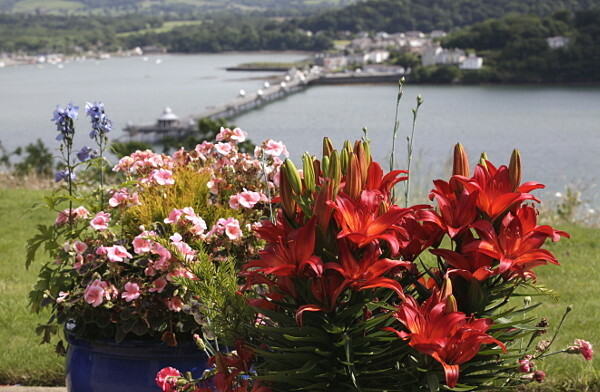 Edge of the Menai Strait at the root of Menai Bridge Pier. Pizza, Seafood (local) and Baked Goods. Childrens’ menu. Open 11:00am – 11pm every day Booking possible for lunch/evenings. Telford Road, LL59 5DR. 01248 712309. Open for food 12:00 – 2.30 (3pm Sundays) and 6pm – 9pm. St Georges Road, LL59 5EY. 01248 712435. Open for lunch and evening meals – times not known. 11 High Street, LL59 5EE. 01248 712 368. 13 High Street, LL59 5EE. 01248 713950. Four Crosses, LL59 2RW. 01248 717778. Tandoori Restaurant, 300mtrs on the Pentraeth road from Four Crosses roundabout. Mona Road, LL59 5EA. 01248 715409. Glyngarth, LL59 5PD. 01248 713364. Dale Street. LL59 5AW. 01248 715000. Mona Road. LL59 5EA. 01248 715409. Seawaves Neptune Fish and Chips. Bridge Street. LL59 5DW. 01248 716398. Four Crosses. LL59 2RW. 01248 717778. Indian. Taste of India. 27-29 High Street. LL59 5EF. 01248 715187. Indian. 13 High Street. LL59 5EE. 01248 713950. Indian. 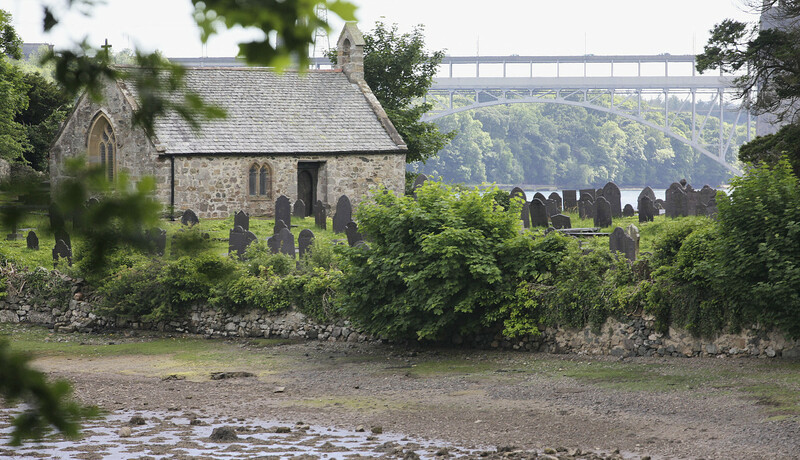 This year’s Gŵyl Tysilio Festival takes place in St Tysilio’s Church on Church Island in Menai Bridge. The island is nestled in the Straits between the two bridges and is accessed along the Belgian Prom or through Coed Cyrnol woods. Music and poetry will be on the agenda. Lunchtime concerts are free, while tickets for evening concerts, starting at 7 o’clock on Friday, Saturday and Sunday, are £6. Tysilio came to this small island in 14 centuries ago. This place became, and has remained, a place of pilgrimage. It is a haven for wildlife and for all those people who seek peace and escape from the ‘hurley burley’ of modern life. For one week each year, the ‘hurley burley’ comes to Church Island when we celebrate the Church Island festival. This will be the forth festival and there will be a programme offering something for all tastes. The dates are July 11th – 16th and this year’s theme is ‘Bridges not Walls – Pontydd nid Muriau. On this island, we are in sight of two bridges, but the theme is trying to reflect something about our own age. Bridges connect people, walls separate. This recording gives a flavour of last year’s Gŵyl Tysilio Festival. It can be listened to on soundcloud.com using the link below. It runs for about 30 minutes. Saturday:	Sioned Roberts – Clarinet -1pm. Hilary Davies – Flute & Violin – 3pm. Menai Bridge Town band on the Belgian Promenade at 2pm. 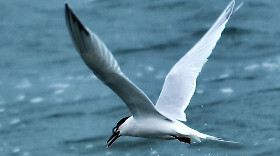 Some of Duncan’s wildlife photography can be seen here, taken on our island or just offshore. The Apartment at Coed y Berclas is a favourite of Rachel and Duncan who come to relax in the magnificent view. Their holiday weather was beautiful and, whilst travelling around Anglesey, took a boat trip along the Menai Strait to Penmon. They were lucky to see porpoises playing around the boat – and captured some shots to add to Duncan’s wildlife collection. Our guests also visited Llanddwyn; three miles of beautiful sandy beach fringed by woodland. A walk along the sand leads you to Ynys Llanddwyn (Dwynwen’s Isle). Dwynwen lived on the island in Celtic times. She is still the patron saint of lovers in Wales and her small chapel is a place of pilgrimage. 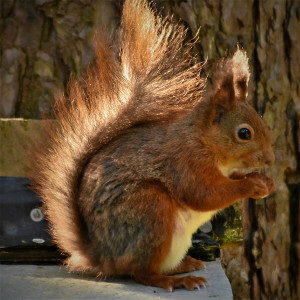 Whilst walking through the woodland, our guests were lucky enough to see one of Anglesey’s red squirrels and Duncan took this lovely photograph. Grey squirrels have been removed and the red squirrel numbers have consolidated because Anglesey is an island. They are, after all, our native wildlife species so it is good to see them taking back their woodland territory. 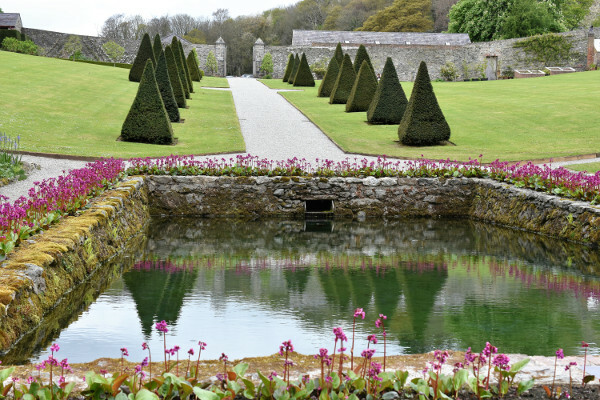 The Hidden Gardens at Plas Cadnant are about two miles from Coed y Berclas. Anthony and his partner have lovingly restored the original gardens over the past twenty years. Our Guests described the gardens as ‘a sheer delight’ photographing the calm pool and topiary as a reminder. We always look forward to welcoming returning guests to Coed y Berclas! The holiday season is well under way here at Coed y Berclas with Sunshine and showers and Spring’s arrival. Our guests in The Cottage and Apartment have had a good balance of sunshine and showers recently. We have had lovely comments in the Visitor’s book and lots of promises to return, clearly enjoying their holidays to the full. We love greeting guests back time after time – they become friends. The sunshine and showers made gardening a challenge too. The weather is kinder with Spring’s arrival so birds are in full song. Our vegetable patch has been thoroughly weeded, and seeds are planted to feed us organic vegetables for the year ahead. Picking our own fruit and vegetables in our own garden is a joy. The fruit trees in the orchard have all flowered well and the spring blossoms were not harmed by winds or heavy showers. We should expect a good crop of fruit later in the year. Guests staying in Coed y Berclas Holiday Cottage enjoy the orchard as part of their private gardens. As this is a bank holiday weekend, we have seen many yachts sailing through the Menai Strait. 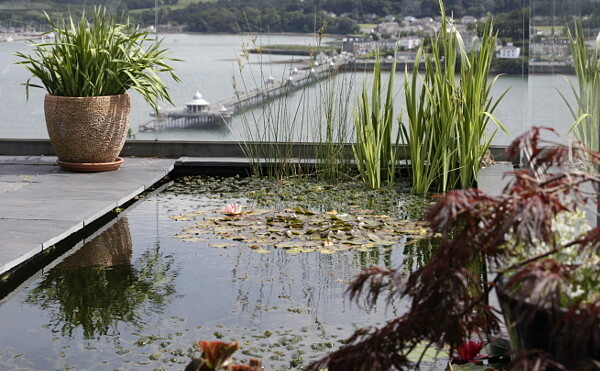 One in particular makes an elegant and tranquil scene from our terrace. The yacht is a fine example of the legendary Nicholson 35. She is moored on the Menai Strait, and we can see her framed perfectly through the viewpoint in our woods. The birds at Coed y Berclas are incredibly busy as the days lengthen. They fly from branch to branch, singing and warding off interlopers, or search for bugs and worms in the grass. Everything seems so very alive – except this worm in the Song Thrush’s beak!. Whenever I’m working in the garden, I’m quickly joined by a robin, which comes incredibly close to snap up the worms I’m disturbing. It is a real privilege to be so involved with nature. There’s a lot of work to do in the garden in spring, but it’s wonderful to work outdoors… soak up the sunshine and dodge the showers! It’s 10:00 am and I’m sitting down for a few stolen moments to write a blog – there’s a lot to catch up on. This morning the tide is high and there is a shimmer of light on the water in the gentle breeze. We watch more yachts sailing by, on the Menai Strait, as the season begins. The pink fishing boat, ‘Lottie Holly’, has just passed the end of Bangor Pier and is motoring south west, towards Caernarfon. The mountains of Snowdonia ar partly shrouded in cloud and the sun is playing hide and seek. I hope the weather will be kind to me today, I need to finish preparing the vegetable patch for planting. Daf has built a new door – from scratch! – for the Cottage utility. It looks wonderful and keeps the leaves out. We have had a lot of work done on the lower banks at Coed y Berclas. They have been re-profiled and turfed. They are splendid. The only drawback is the amount of grass-cutting Daf will need to do but,as he says, it’s cheaper than the gym. That’s a reminder to me that I should be digging the veg patch – great, the sun’s shining! 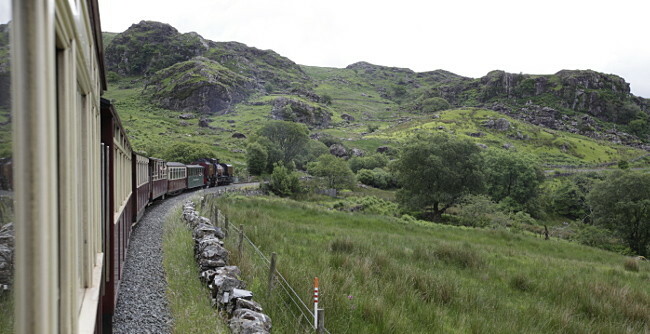 …the Welsh Highland narrow gauge railway running between Caernarfon and Porthmadog, where it links to the Festiniog Railway, running from Porthmadog to Blaenau Ffestiniog high in the slate mountains of Snowdonia. 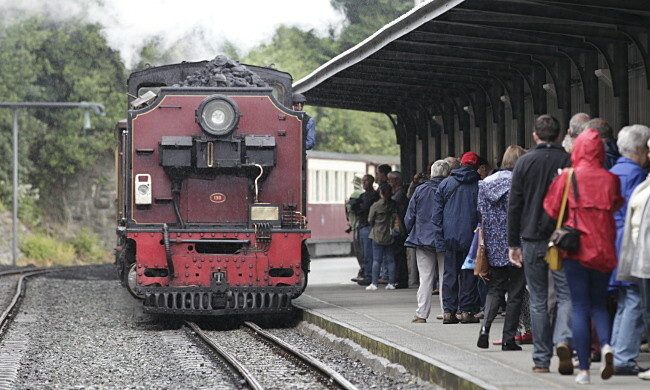 At 09:30 on Thursday 16th June we were standing on the platform with lots of others awaiting the arrival of the 10:00 steam engine which would pull the 10:00 train from Caernarfon all the way to Porthmadog passing the foot of Snowdon on the way. 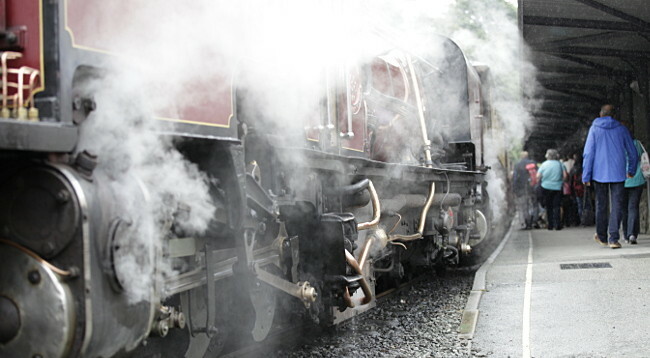 When the engine pulled into the station, there was a ripple of excitement. 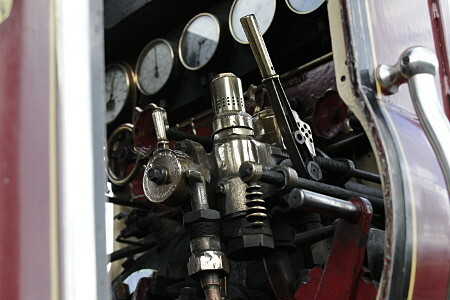 It is, like all steam engines, a living breathing thing, a Welsh dragon come to life. 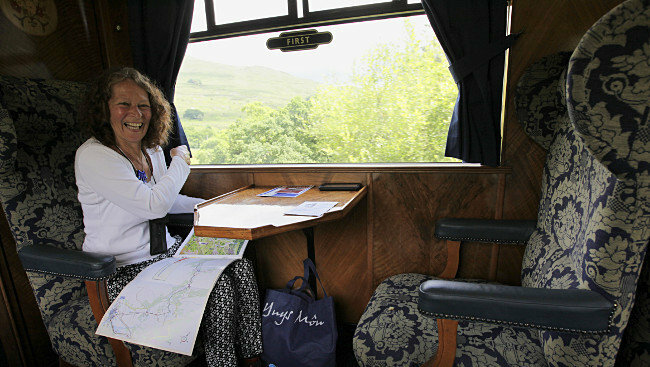 Aboard the train, I felt like an excited child on a birthday outing. 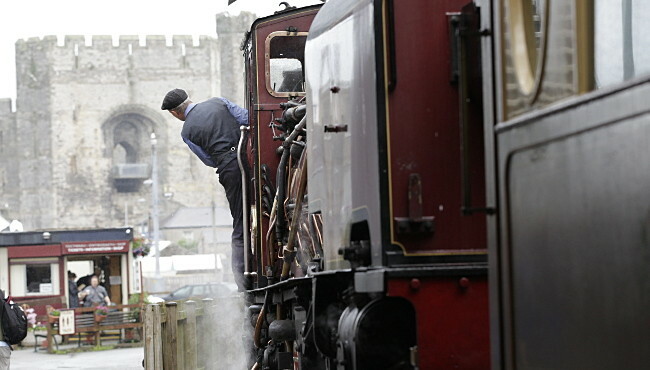 As the train pulled out of the station, I looked back to watch Caernarfon Castle slipping out of sight as we puffed along the track. 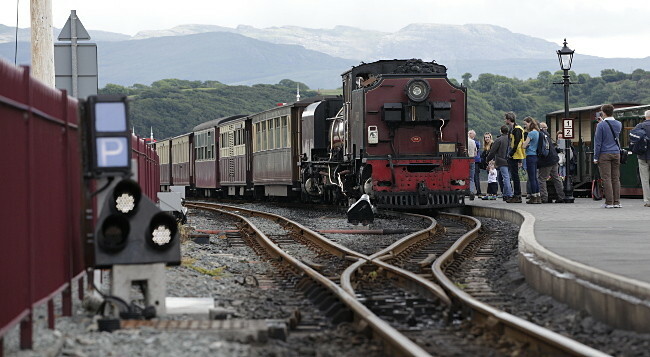 The narrow-gauge engines on the Welsh Highland Railway run on tracks two feet wide. 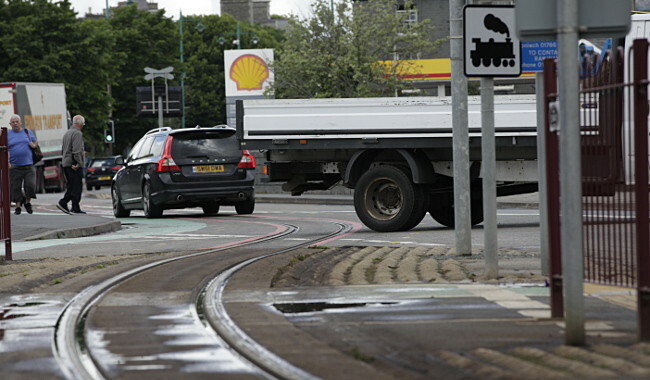 To go round the sharp corners required to take them snaking up steep inclines, they are articulated in two places. 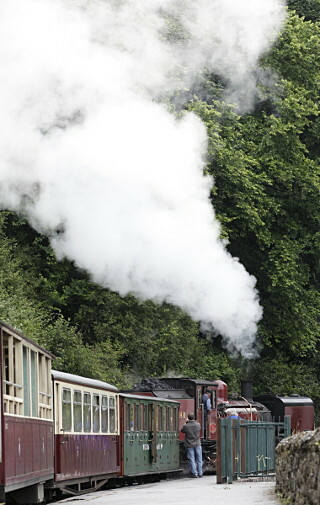 Each steam engine is made in three parts, a central boiler with driver’s cab, a watertank and a coal bunker. The brief history of the line between Caernarfon and Porthmadog goes back to 1864 when a tramway was built to carry slate from the mountains to the coast for export. 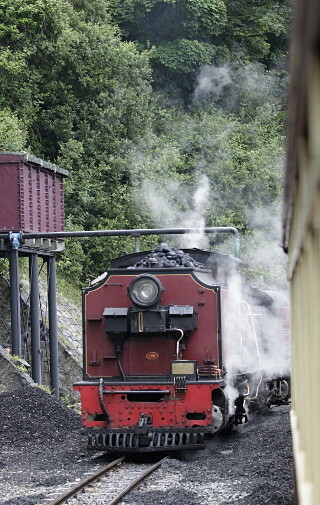 The line was extended over time until it eventually joined up and carried both slate and passengers. 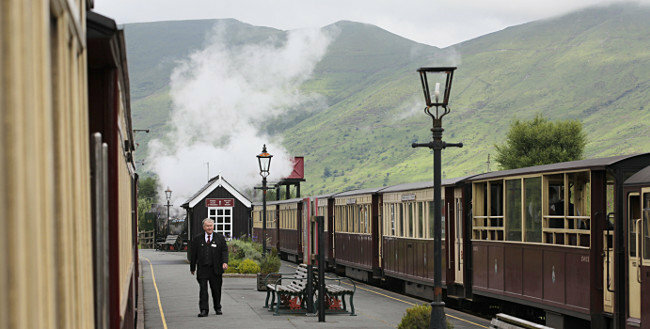 Sadly, the Welsh Highland Railway was never a financial success and in 1944 a ‘winding-up’ order was made. The company was never actually closed, so eventually, in 1989, it was possible for the Ffestiniog Railway to make a bid for the track. 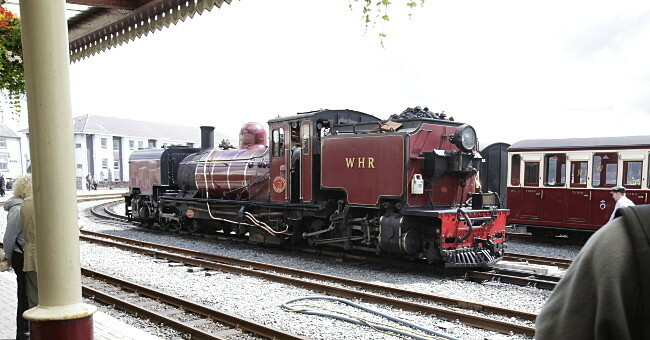 In 1999, they aquired the assets from the official receiver and with the aid of a Milleniun Commission grant, much fund raising, and a lot of volunteer labour, the Welsh Highland Railway was reconstructed, bit by bit, to become the wonderful entity it is now. It is still run on volunteer labour. 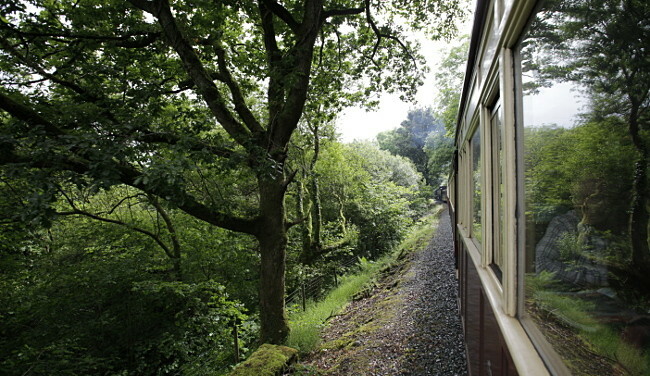 The journey from Caernarfon to Porthmadog is 25miles long and runs through beautiful countryside. 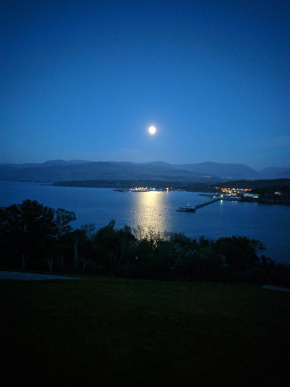 It climbs from sea level at historic Caernarfon to 197metres before descending through forests and the beautiful Aberglaslyn valley until it arrives back at sea level in Porthmadog. We loved every bit of our journey and can heartily recommend it to visitors. We took lots of pics and video. The best bit of the end of the end of the journey was that we could do it all again on the return journey from Porthmadog to Caernarfon! 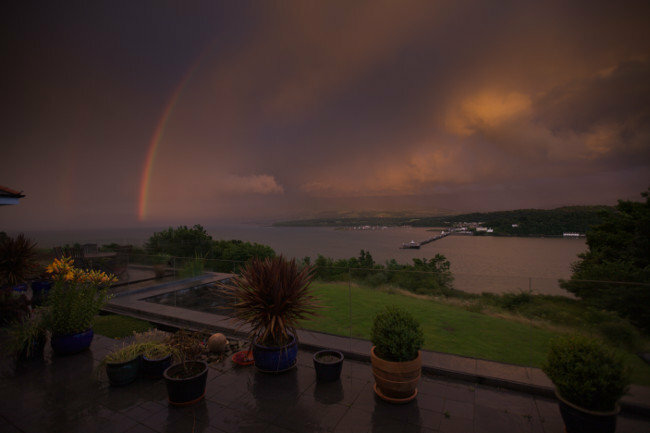 This amazing shot of a Rainbow in eerie evening light appeared on Friday after a strong rain shower, so Daf whipped out his camera and fired off a few shots. The shot below was perhaps the best. We have seen this effect a few times while living here. Because the view is so expansive and the strong evening sun is striking the low level rain clouds from the North West, the clouds are lit up orange and cast a veiled light over the area beneath – in this case, us! The shot was taken from the Berclas terrace just beside the holiday apartment main bedroom. We have two ponds at Coed y Berclas – or water features. The upper one is a rill on the terrace in front of the house. It contains water lilies, irises, oxygenating plants and a few water insects. The lower one is larger. In addition to having similar plant and insect life, it is also home to a number of newts, and in spring we are visited by two or three Mallard ducks. They stay only briefly and always fly off to a safer roost for the night. A less welcome visitor is the occassional heron. We worry that it will eat the newts or puncture the pond liner. Fortunately, there are no fish to keep it visiting, so I suspect it flies away disappointed but has a short memory! Unfortunately, we also have blanket weed in both ponds, which is very invasive. Therefore, from spring throughout summer, I have the task of taking out as much as possible, to stop it taking over. I don’t think we will ever get rid of it, but there was hardly any in the upper pond this year. That was very encouraging. This might be seen as just another task to add to a long list, but here’s the funny thing: I really look forward to getting out my specialist equipment and spending ages by the pond picking out masses of fibrous bits of blanket weed. I put it down to the magical relaxing effect of being by tranquil water. My equipment may not fit most people’s idea of ‘specialist’. It’s a pink plastic hairbrush tied with string to the longest cane I could find. It works really well at picking up clumps of the hair-like fibres. I always look carefully at the blanket weed for wild-life. I have found snails, dragonfly larvae and small newts. 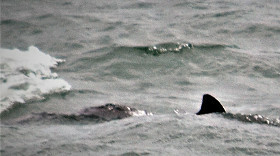 They are all returned to the water as quickly and gently as possible. The dragonfly larvae are fascinating. when mature, they climb up reeds and cling on while they metamorphose into beautiful electric blue insects which dart backwards and forwards, across the pond, on their iridescent wings, hunting for food. I can hear the whirr of their wings as I seek out fibres of blanket weed. It’s wonderful. The old outer cases of the larvae are left clinging to the reeds or fall in the water. I have wondered if they are the reason for the name ‘dragonfly’. The sound of water trickling from the upper into the lower pond also adds to to the sense of peace and serenity. Guests staying in the Luxury Holiday Apartment at Coed y Berclas, step out from the sitting room onto a patio with table and chairs, which is close to the pond. 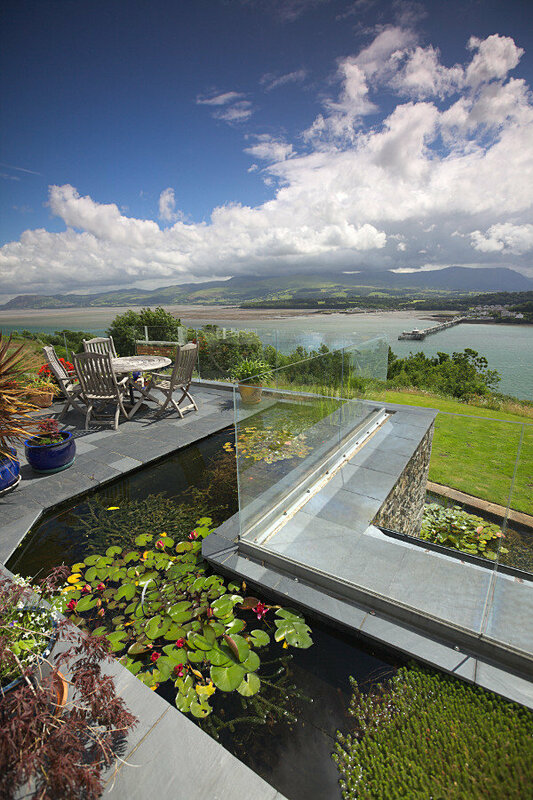 While enjoying the view of the Strait and Snowdonia, they can also listen to water falling into the lower pond. 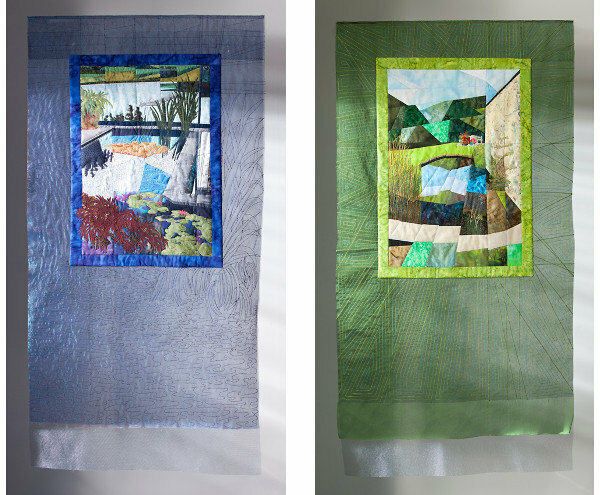 As a member of Cwilt Cymru I produced two quilted textile hangings to our chosen theme ‘Cynefin’. Cynefin is a Welsh word which refers to a place where one belongs. It has a spiritual and emotional dimension as well as a physical one. Because of my relationship and sense of belonging, I chose to create images for Cynefin based on our two ponds. Daf and I were both brought up near water. I lived close to the North Sea and Daf to the Menai Strait. Neither of us would wish to live too far from water. 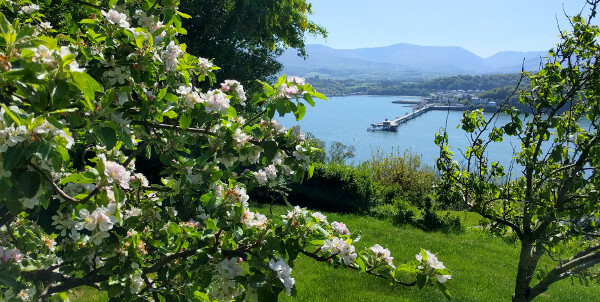 At Coed y Berclas we are on an island surrounded by water, we overlook the Menai Strait, and over Bangor Pier to Snowdonia, and we have our two ponds. This makes us feel very ‘at home’.